Four successive earthquakes were felt in various parts of Bohol on Monday morning, the Philippine Institute of Volcanology and Seismology (Phivolcs) said. The strongest among the series of tremors was a 4.5-magnitude quake that hit seven kilometers northeast of Antequera at 10:53 a.m. It was felt at Intensity III in Tagbilaran City, Intensity II in Cebu City, and Intensity I in Sibulan town, Negros Oriental. 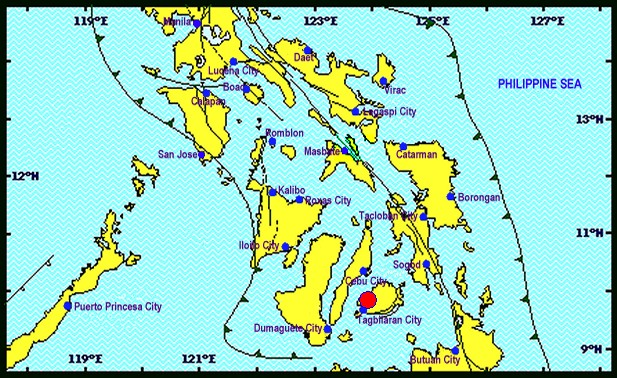 Philvolcs said that the earthquake which was tectonic in origin hit at a depth of just 10 kilometers below the ground. 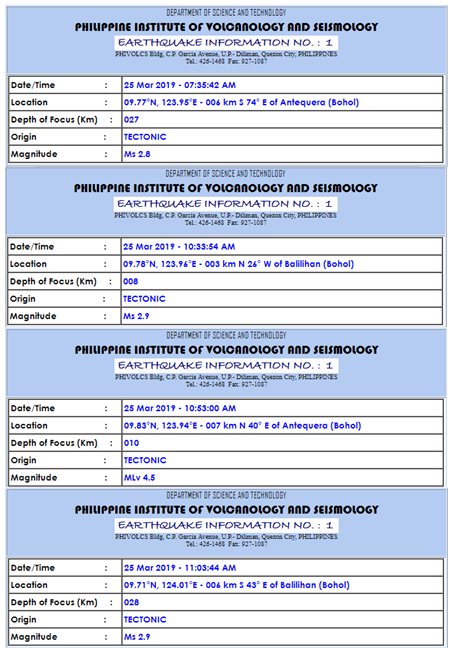 Other Phivolcs reports showed that weaker earthquakes were felt in various areas on Monday morning. The tremors hit six kilometers southeast of Antequera at 7:35 a.m., three km northwest of Balilihan at 10:33 a.m. and six km southeast of Balilihan at 11:03 a.m., with magnitude level of 2.8, 2.9 and 2.9, respectively. The reports from Philvocs said that no damages and aftershocks were expected from all four earthquakes.